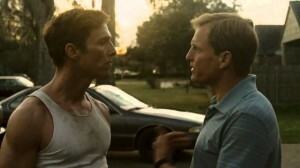 Episode #19 – Her and HBO’s True Detective | That's a Wrap! into question the very nature of relationships. How are they defined? Refined? Built? That’s A Wrap guys an awful lot. In our second segment we take a look at HBO’s fascinating police procedural, True Detective. Starring recent Oscar winner Matthew McConaughey and Oscar nominee Woody Harrelson, has HBO fashioned a thinking man’s serial-killer police-procedural or an amateurish existential hodgepodge of Wooderson philosophy? Hmm, perhaps both? The one literary reference must know to appreciate True Detective. Is True Detective too clever? Interview with director Cary Fukunaga.